Cherry Mobile Saturday Flare Day | iStoryang HaaayTek! 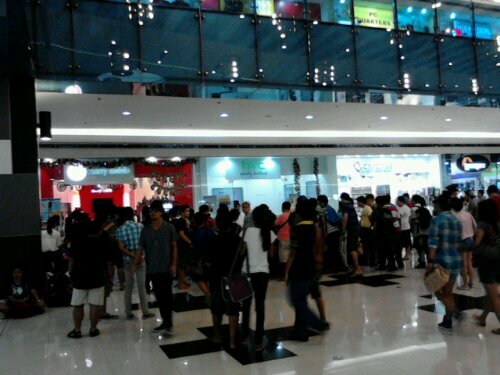 Hundreds have lined up for the most anticipated Cherry Mobile smartphone this year–the FLARE. Consumers waited as early as 10 o’ clock this morning at the Cherry Mobile shop in SM North EDSA, one of the only two stores that are scheduled to sell the first few units of Flare. The first guy in the line was reportedly been in the mall since early in the morning just to be sure he got the Flare first. A Cherry Mobile representative told me that only 500 passes are issued today and shall be given the opportunity to own a Flare.There’s no assurance when the stocks of the Flare shall keep flowing. As of today, it is not known when the regular stocks of the Flare shall be available. What this smartphone has that it attracts the consumers? The catch is the price–P3,999 for a 1.2GHz Dual Core Snapdragon Processor by Qualcomm and it is using the Android Ice Cream Sandwich operating system. It has a 4-inch IPS capacitive touchscreen and complete with connectivity features: WiFi, Bluetooth, USB, and 3G. The internal memory is 4GB and can be expanded up to 32GB. The primary camera is 5MP coupled by a front-facing camera. To top it all, Flare is a dual-SIM smartphone at a very affordable price. Given its specs, many are saying the phone should be priced not below 8K. Cherry Mobile hasn’t given a statement why they have priced the Flare at below P4k when its original brand–Karbonn A9+ is sold in India at about 8K equivalent in Peso. Flare is a rebrand of Karbonn A9+ manufactured in India. The line to own a Flare was more than five layers filling the space at the CyberZone of SM North EDSA. Each buyer was given a pass to be entitled to one purchase only. The other store that initially sold the Flare on Saturday was the Robinson’s Place Manila. Buyers are controlled to prevent overcrowding the CM store. After getting their unit, the consumers are advised to proceed to the table outside (left pic) where CM representatives checked the units bought by the consumer and at the same time gave a brief about the unit.